If you were disappointed that all those rumors about Facebook unveiling a phone this week came crashing down with the announcement of a creepy search engine that doesn't even really work yet, take heart: The social network just added a free phone-call option to its Messenger mobile app for U.S. users, a feature that seemed trapped in Canadian testing grounds. Theoretically you can kiss those talk-time minutes from your cellphone data plan goodbye — as long as you're content to have all your voice conversation with other Facebook users over data or Wi-Fi by way of your Messenger app. It's called Voice Over Internet Protocol talking, and it's the same thing that was supposed to help Skype take over the world last decade, and it might end up being a lot more useful to the savvy consumer's pocketbook than the Graph Search, which Mark Zuckerberg called the "third pillar" of Facebook yesterday. To make a call, all Facebook users have to do is tap the little "i" at the top right corner of the revamped app, which leads to the screen pictured above at right. 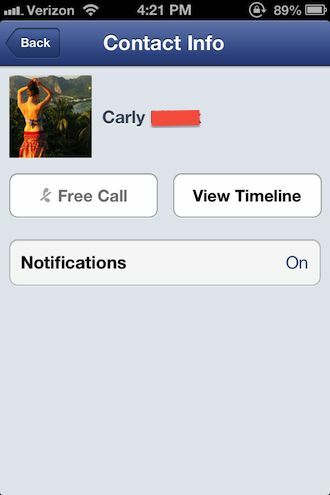 As long as the other caller has the Messenger app, U.S. users can now tap Free Call, and, well, it's just like making a phone call, really — except that instead of ringing, a push notification pops up: "You have a call from Carly." Of course, this isn't a Facebook-branded piece of hardware, or even the full-scale cellphone OS, as the rumorers suggested. But this software could replace the traditional way we make calls. As we've explained before, Facebook has a lot of things going for it in taking VoIP calls to the masses in the way the Skype never really could: Messenger's got all the right contacts, it costs almost nothing, and it even works in areas with terrible reception. Not to mention it works over data plans for everyone and not just people with compatible phones — Apple's FaceTime feature only works on the iPhone 4S or 5, even if it's more available now. Still, Facebook doesn't have video chat for Messenger. But, hey, one world dominating step at a time, right?